supreme quality products and services. The certification is among the first of its kind for any company in the friction material sector in East & Central Africa. 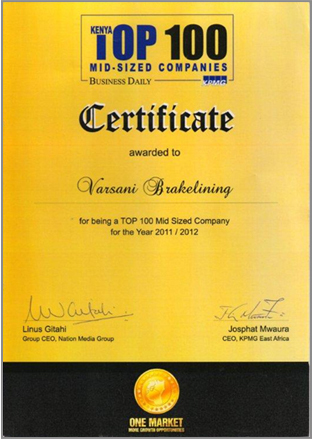 VBL achieved coveted recognition by Business Daily through the Top 100 awards for the year 2011/2012. exceptional service & value to customers along with leadership and training for our employees has enabled us to win this award.